Temiscaming Titans Billet Family Introduction. As we look forward to our upcoming 2015/16 season, the team will welcome as many as twenty-five players from across the United States and foreign countries to our town. These players range in age from 16 to 20 years old. Their stay in our town will last from late August until mid March, depending on playoffs. 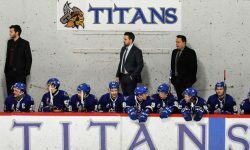 When these young men become a member of the Temiscaming Titans Hockey Team, they do not live on their own, they require accommodations. This is where the billet family becomes very important as each player is placed in a home within the local community. What is Billeting? Billeting is when a local family welcomes into their home, a visiting player. The family that offers to help in providing a safe place for the visiting player is called a host family. Why Billet? Billeting can be a very exciting and rewarding experience for all those willing to open up their homes to dedicated players. Many families who have billeted in the past usually look back at their experience with fond memories. In fact, many families still stay in touch with players they had billeted in the past as those same players move through the university and professional ranks. Key benefits to you and the Hockey Team when you volunteer to billet are: • Build lifelong friendships with players and their families; • Assist young players to enjoy safe and comfortable environment while enjoying hockey; • Provide a great social and cultural experience; • Assist visiting players to lessen expensive living costs, making participation in Junior hockey possible; • Show support for yourcity’s hockey team and help them to be successful; and • Assist in providing a special service that will lead to a successful hockey season for a young player. Are You Interested in Becoming a Billet? Our players want to experience life as part of the hockey family and to live in a caring environment, to have a home away from home. Our billets are excited to welcome someone new into their lives. Having a hockey player in your home takes time, patience, and a willingness to share. There are lots of differences to overcome, both cultural and personal, but learning about these differences and celebrating them is part of the joy of welcoming someone new into your home and, in many cases, making a new friend for life. What Makes a Great Billet? A caring, sensitive and patient family! It can be overwhelming for a player to be so far away from home. A thoughtful billet family appreciates that each player is unique, and that communication and mutual understanding take effort. Our billets are interested in sharing their lifestyle in a positive and mutually rewarding way. We do not accept billets who are interested in money alone. These motives are obvious to players, and interfere with the intended billeting experience: a safe, secure, welcoming environment to learn and grow in. Things to Consider Do you have time for a player? Even the most self assured players appreciate good quality time with their billet family. Is everyone in your house hold ready to accept someone with a different background? If you have children, are they comfortable with bringing another person into the family? Other key issues to be aware of are: • The Junior hockey player’s schedule is irregular as they try to balance school or a job with their hockey schedule which includes games, practices, road trips, some of which are overnight, and other team related activities. The Temiscaming Titans will provide each billet family with a schedule of events and activities prior to the start of the regular season. • Some players may choose to return home during the League’s Christmas break and would return prior to the New Year to resume playing. • Many players will return home once the season is over. • All meals and accommodations while on road trips will be covered by the Team and/or the Player. Responsibilities of the Host Family Billet families should be prepared to provide the following in order to make the player’s stay a comfortable one: • Treat billeted players as you would want your child treated if he/she were away from home; • Inform billeted players of your expectations and house rules; • Provide a room for the billeted players to sleep. This should be a dedicated room with a double bed or larger, a dresser, closet, and a desk with chair, preferably with a television in the room; If at all possible to have internet with wifi in house. • Provide a student desk for homework preferably in a quiet area of the home if not located in the bedroom; • Provide transportation to and from the rink. Most players come with their own transportation. • Provide family type meals including breakfast, lunch and supper as well as snacks for the visiting player; • Provide use of laundry facilities and detergent; • Confirm with the players their allergies, medical conditions, and special dietary needs and support them with these requirements; • Support the player, communicate with him, and be understanding; • Communicate all concerns regarding the player to the Billet Coordinator; • Make the player feel at home and part of the family; and • Provide information about their homes to the Billet Coordinator (e.g. presence of pets, smokers, etc) and necessary contact information (including work telephone numbers, cell phone numbers, and email addresses). All information must be current. We will conduct an interview and back ground checks are required on a adults over 18 years old living in a host family home. Welcome to the Titans Family!